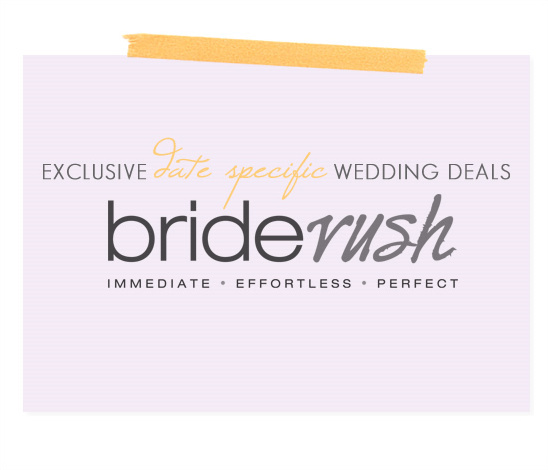 BrideRush offers last-minute date-specific deals on wedding vendors and venues to brides-to-be around the country. It almost as if Groupon and Priceline got hitched, but it’s better and more relevant to you and your wedding planning process. BrideRush has crafted something truly unique, specializing in last-minute weddings and short engagements by listing open dates up to six months out. Let's say you are ready to book your last-minute wedding plans. In order to secure any date or deal listed on BrideRush, you will pay just $25. You would then receive a voucher entitling you to your deal on a specific wedding date. Remember each deal is exclusive to a specific date made available by the vendor. Dates are not flexible, but they do have new deals that are added daily. BrideRush can help you find venues, day of coordinators, djs, photographers, photo booths and more. A little more about BrideRush. It's new whole perspective on weddings, BrideRush is a date-specific deal site for fast-planning, busy couples. BrideRush offers brides and grooms across the U.S. deals on photography, videography, DJs, venues and more, but the deals aren’t generic. Each deal is exclusive to a specific date made available by the vendor. BrideRush’s team, known as the BargainZillas, work with vendors and venues nationwide to secure discounted rates on open dates.